All transactions are safe and secure with a reliable history in online purchasing behind each of our associates. Buy the Buddy the Elf's Food Groups t-shirt to own Elf clothing and merchandise. What are an elf's four main food groups? Candy, candy canes, candy corn and syrup of course! They require a lot more sugar in their daily diets than humans. 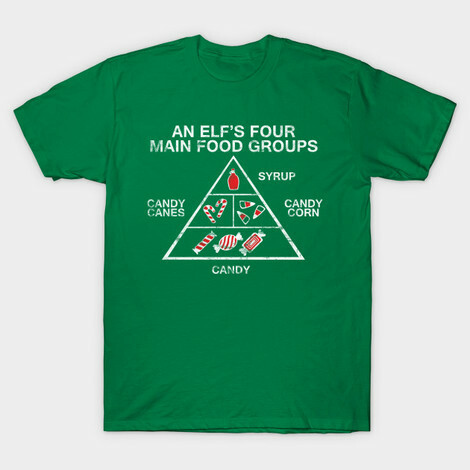 The front of this Buddy the Elf t-shirt displays the humorous food pyramid that Santa's helpers use to regulate their nutrition. It's no wonder that they have so much hyper energy. In addition to the Buddy the Elf's Food Groups tee above, browse the Elf Clothing Gallery for more apparel like men's and women's clothes, kids shirts or hoodies.